Abby the Librarian: 48HBC - Finish Line! Whew! 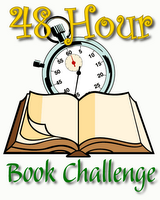 I just crossed the finish line for MotherReader's 5th Annual 48-Hour Book Challenge. What fun! And I'm halfway through The Sweetness of Salt by Cecilia Galante. I had such a good time this year and I really made an effort to check out other people's blogs and leave encouraging comments and tweets. The social networking aspect of the challenge was really helpful whenever I needed a little break from reading or needed some encouragement! The easiest time during the challenge was probably Saturday morning when I woke up raring to get back to reading! The hardest time for me was this afternoon around 2:00 after I'd taken a break for lunch and I started to get really sleepy. I rallied, though, and ended up finishing two more books. I read from many different genres including realistic fiction, fantasy, sci-fi, and non-fiction and that helped mix things up a little bit and keep me interested in my books. Having some nonfiction really helped as those were shorter books and they gave me a sense of accomplishment for getting more books read. For the novels, I had a mix of short books and long books. I tried to read books that I was really excited about and, while I loved some of them more than others, I didn't really hit on any duds this time around. I was hoping to read 10 books and I made that goal! I have to send a HUGE THANK YOU to Pam of MotherReader for organizing this fantastic event. It's truly an event I look forward to each year. I love the sense of community it brings as well as the excuse to do nothing but clear a whole bunch of books off my to-be-read pile! Plus, I don't mean to be that girl thinking about her page stats, but yesterday I had over twice as many visitors as I've ever had on one day before. So thank you to anyone who visited my blog and especially thank you to those who left encouraging comments, tweets, etc. Those kind words made it so much easier to complete the challenge!! If you're still going, keep up the good work! Read, read, read! Blog, blog, blog! Congrats on making it to the finish line! Thanks again for stopping by to cheer me on! Enjoy your movie! Congrats Abby! You're an animal!! Great job Abby! Thanks for stopping by ReadSpace to cheer me on! I wish I had had more time to visit blogs this year. You're welcome! Thanks for playing! Congrats on getting done. I am inspired. Oh, so close to your "secret" goal! But congratulations on surpassing 24 hours by quite a bit. I also enjoyed having time to visit other blogs this year. This was fun. Excelente, Abby! Sounds like you read great books too. New Cecilia Galante, oh, jealousy!